Hello there ... yes ... I'm here again ..
not quite dropped off the face of the earth! yes we have reached that mellow time of the year .. we are all beginning to prepare for the darker months here .. lots of firewood .. extra tins of beans .. and all that kind of thing. 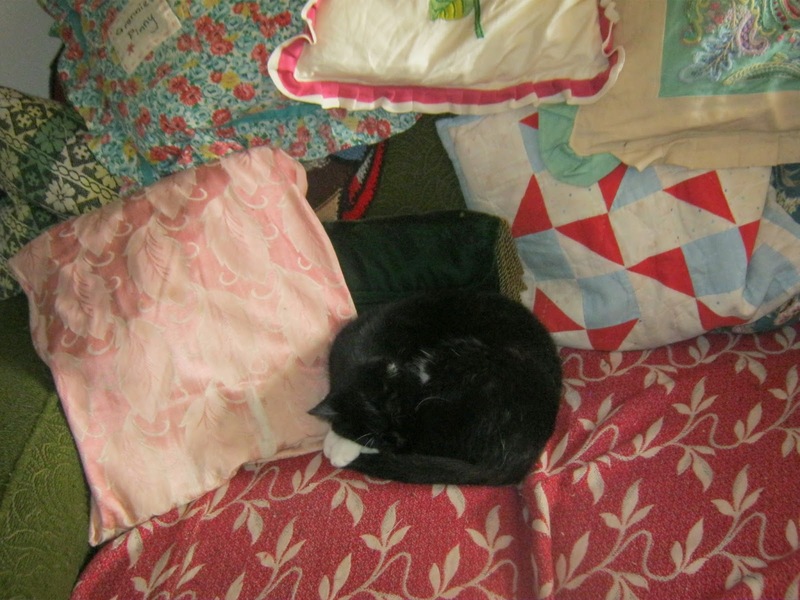 As you can see the cat takes it all very seriously ..
and is practising the 'hunkering down' like mad. We found this little guy when we were chopping wood ... well he's not so little really... any ideas what he might be/become? We tucked him back amongst the wood pile. The Girls are doing really well ... Hubby P has built them a nice little scratching run attached to their deep litter shed ..
so they have been enjoying playing out all summer. Now the leaves are falling I have been collecting them from the paths and tipping them in the chicken run .. the girls just love having a good old scratch amongst the leaves... there must be all sorts of insects and goodies amongst the litter .. keeps them amused for hours. all those delectable goodies they find scratching about in their run ... go to make delectable ... yummy eggs for us. Simple yet sooo delicious ..! The garden ... as has everyone's I should think ..
Can you see in this pic ... my Cardoom has sprouted again for a second time. for the plant to grow up and through next year. The plant grows so big and top heavy that the flower heads always collapse under their own weight .. so hopefully this cage will help support it next summer. 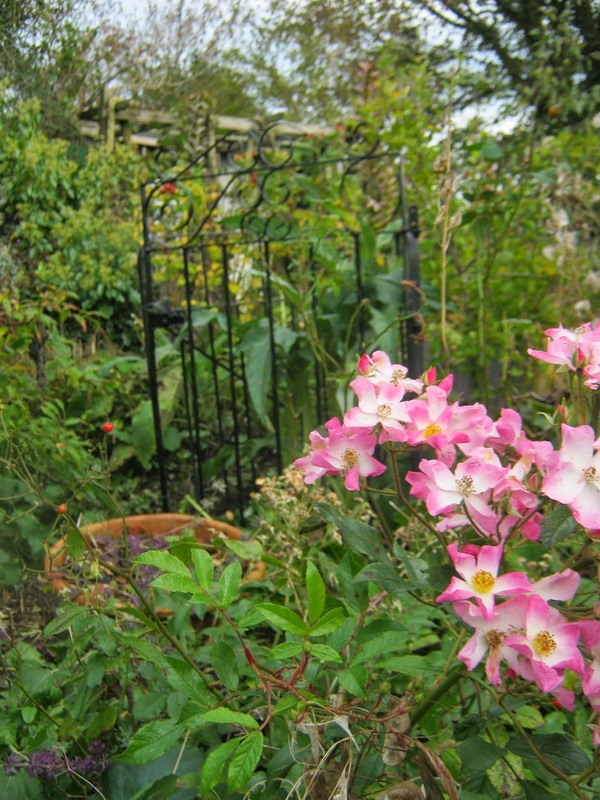 I wanted the cage made from nice old gates so that in winter the structure will not look too ugly .. hopefully it will add a bit of height and interest to the bleak garden. I've planted my Galvanised' garden ..
hopefully they will give a bit of interest over the winter months. goodness knows what we will do with them . its just all the washing and ironing .. guess who gets that job! do drop me a line and say hello! Welcome back, I am so glad that you have had a good summer trading. Hopefully you will be able to take it easy for the winter. That is what I plan to do. Lots of crafting and almost as much tea. Hello Vicky, lovely to hear from you, thought you would be having a busy summer with the weather being so good. Its starting to turn cold now so maybe you will be less busy and have time to share photos of all your delicious pies and puddings and those heartwarming soups you make. 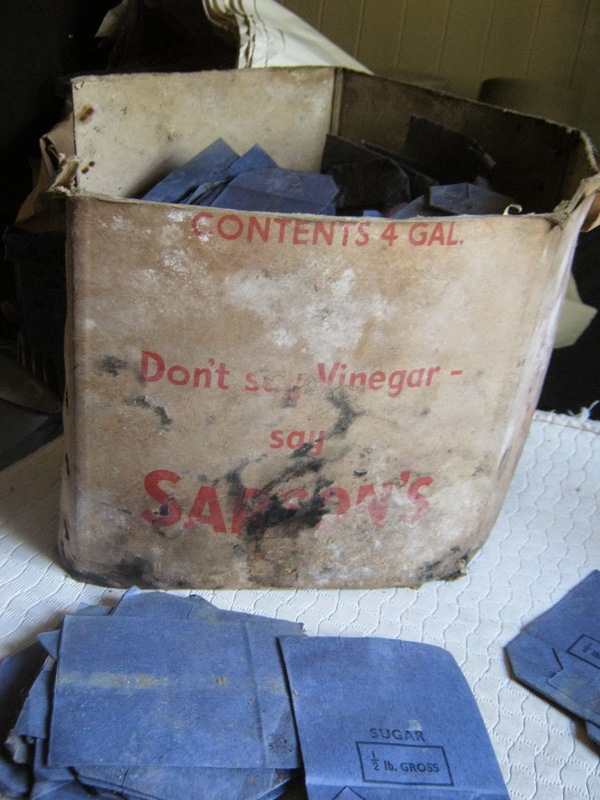 What a fab find those sugar bags are, I bet they will sell on ebay to some kind of re enactment group. hello Vicky, good to see you back. Our cat has suddenly decided she wants our company again, so is hogging all the best warm places to sit too. 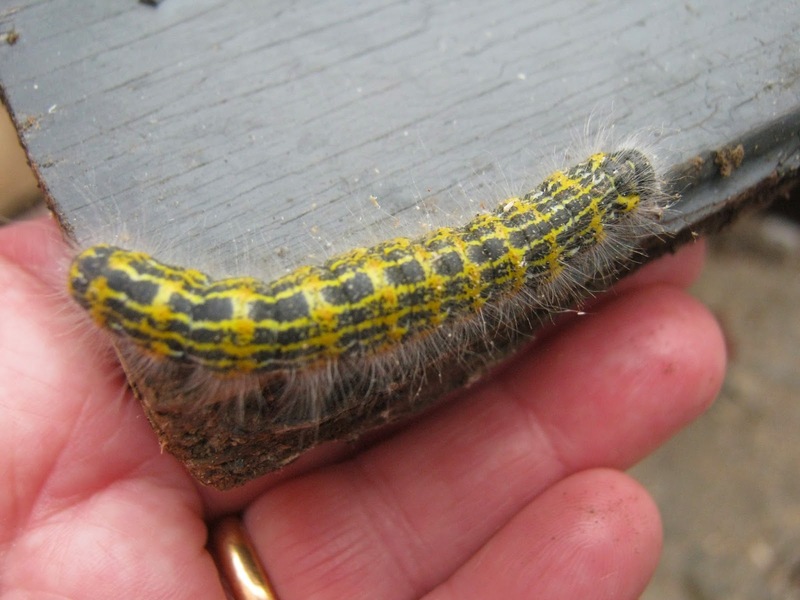 I think the caterpillar is of the Buff Tip Moth. I quite like the orange and black(?) cardy at the back of the rail. Sytrange I know! Glad to see you back! 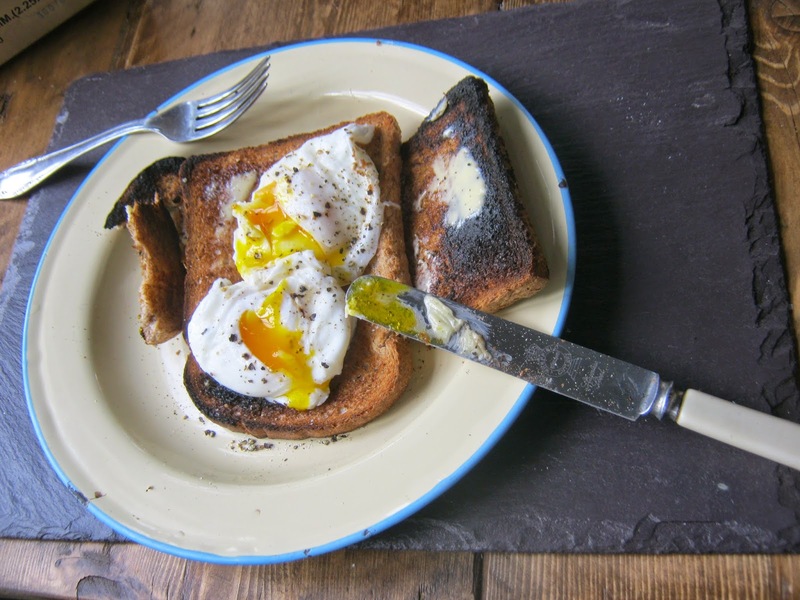 No one can make eggs on toast look so tempting...Sue. Hi there, welcome back. 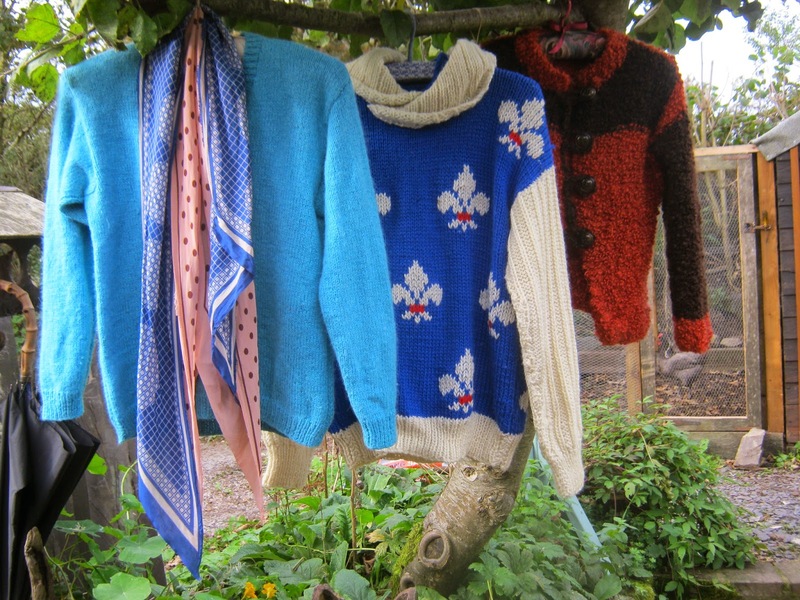 Hope the weather keeps fine for you with all that drying. That orange and brown cardi is SO 1970s isn't it? We have had a late flowering from our little pink rose just like yours (Yesterday is it? ) Plus a second round of one of my Delphiniums - in October! You have been missed! Glad to hear that all is well and you have been busy with work. I love to se what you have found to sell! Welcome back, I love the colour of your sewing machine!! 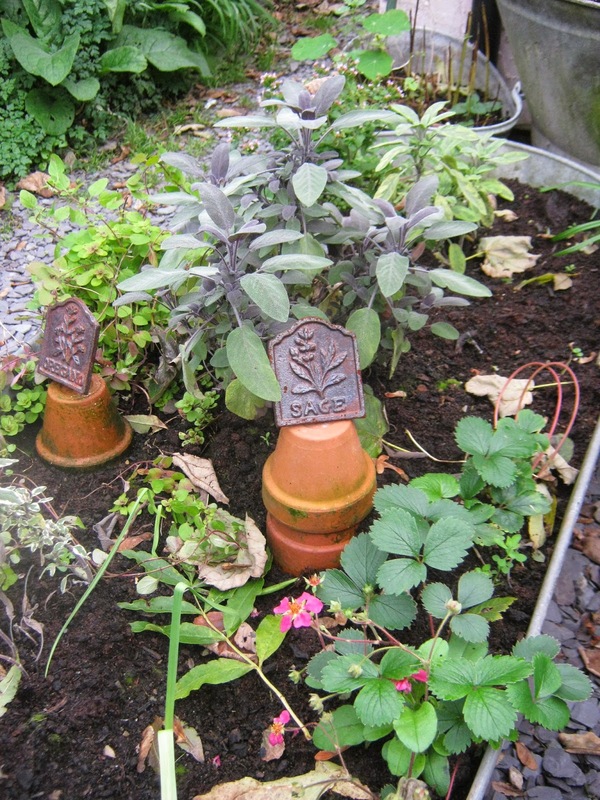 Another galvanised bath herb garden addict, they do look brilliant don't they. My herbs have romped away this year in theirs. So lovely to see you again, glad all is well and that work is busy. Love all your finds, take care. Glad to see you back. I love to see all the fabulous things you find to sell. I remember my aunt (who had a corner shop) having those sugar bags in the late 50's early 60's. I'm glad your back too! 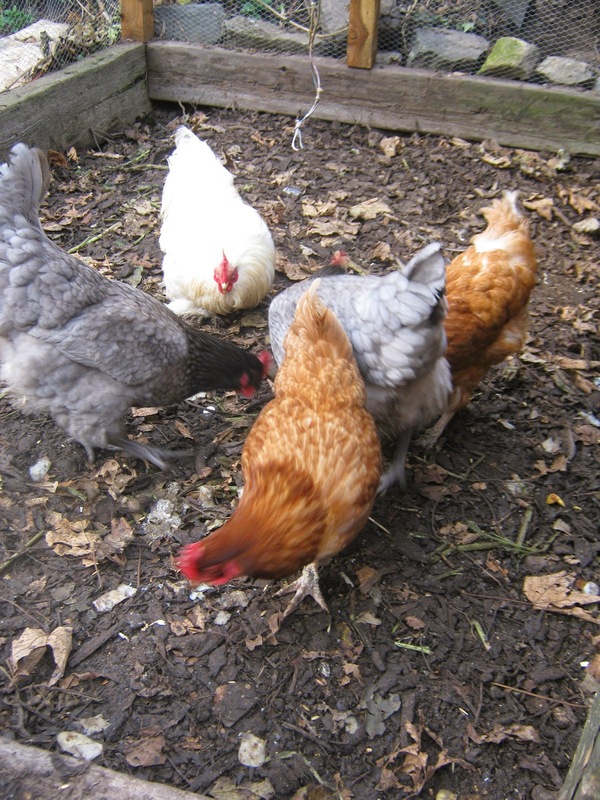 I love to see what great things you do in your garden and with your chickens! I wonder, could I borrow your Hubby for a day or two? Got a few 'little' jobs I just can't do by myself. Just kidding but, would be nice to get those jobs done! I would ask my Nephew but, he's more often than not down in your neck of the woods where he has bought a static caravan for his days off from work or mini hols with his wife. Just when you think you've made all the jams and chutneys there are to be made, along comes someone with a big bag of green/semi ripe tomatoes, 'can you make use of these, I know you make chutney'.! Better get out the pan again! So pleased to see you back, I love to see the treasures you find. Good to see you back, I really enjoy your blog, had a busy summer myself with selling my patchwork at various craft fairs and lots of gardening. Just love looking at all your wonderful finds. Excellent idea to support your Cardoon, I had given no thought to my newly acquired one, I will use one of our willow cages that we had made for the sweet peas.